Organised by the Embassy of Ireland, in conjunction with Bord Bia, Irish Food Board and The Irish Chamber of Commerce Singapore, the evening event featured a range of Irish produce specially chosen by Chef Thornton and the Irish Food Board to demonstrate the quality and flavour of the Emerald Isle’s seafood, meat and dairy products. 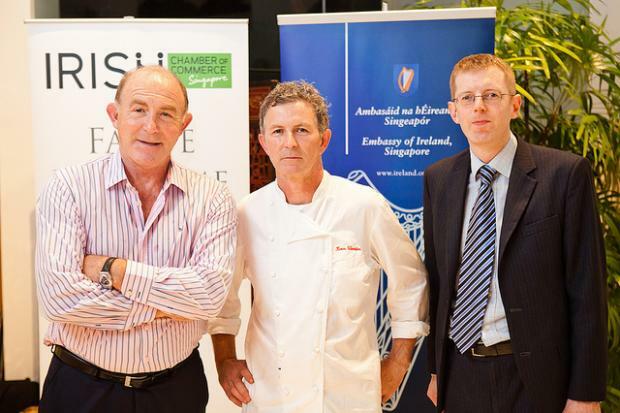 The Irish Ambassador Joe Hayes welcomed Irish food retailers and those involved in food service, wholesale and manufacturing in Singapore to a special Irish Food Showcase headlined by Michelin Star Chef Kevin Thornton. In addition to Burren Smokehouse organic smoked salmon, McGeough’s air dried lamb and the world famous Cashel Blue cheese, guests were treated to a cooking demonstration by Thornton of his award-winning scallop dish; Sautéed Bear Island king scallop with truffle mousse, scallop carpaccio, and enoki mushroom fingers of truffle on bog oak. In 2010 exports of Irish Food and Drink to Singapore exceeded $37m (€21m). Led by Ireland’s global brands, alcoholic beverages was the largest category accounting for 44% of sales. Dairy exports accounted for 40% and meat 13% of sales, making Singapore Ireland’s third largest Asian market overall and the largest in per capita food sales. The value of Ireland’s food and beverage exports to Singapore also encompasses sales by multi-nationals with factories in Ireland, such as Abbott. Home grown Irish companies including Kerry Ingredients and Glanbia Nutritionals also have a strong foothold in the Asian market with Singapore based headquarters, and are open to sharing their expertise with others trying to break into the region.